BAMBOO COVER - Ultra-Luxurious Kool-FlowTM Micro-Vented Bamboo Cover is Machine Washable. The key to feeling better during the day is a great night's sleep. If you want to enjoy a restful night's sleep and wake up without annoying neck, shoulder and back pain, ordinary pillows simply won't do. You must choose a pillow that offers proper support and alignment. Discount foam pillows don't have the right contours to align your neck and spine and - over time - can lead to nerve or disc problems. Expensive down pillows are often too soft to provide enough support. Both will force your head into unnatural angles that don't promote good sleep or overall good health. This memory foam pillow by Perform Pillow is different. It has been designed and tested by Dr. Samuels - a chiropractor with over 20 years experience. With it's contoured shape and special density foam, it is extremely comfortable, yet offers correct support exactly where you need it. It keeps your neck and spine aligned for a more comfortable night's sleep. And because it is a high quality foam, it will retain it's special shape for years, unlike shredded memory foam that can lump and warp over time. 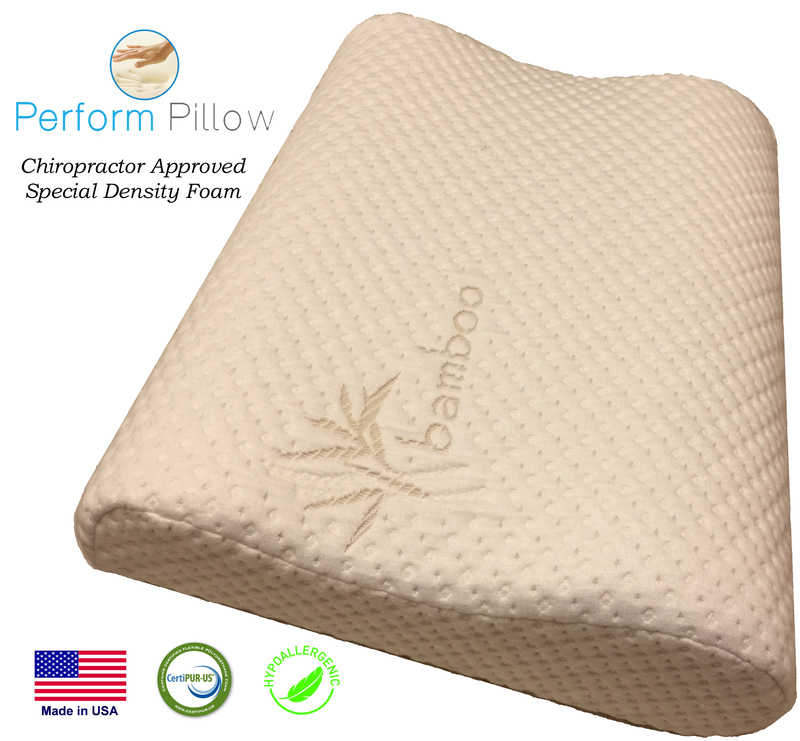 The Perform Pillow features a breathable bamboo cover, so you'll enjoy a cool, allergy-free sleep as well. The cover is machine washable and even Eco-friendly, so you can rest easy. Order your memory foam pillow from Perform Pillow today and start enjoying better sleep and improved health tomorrow.